A bear came to its final rest early Monday morning, just off of Galloway Road, above Downieville [in the northern Sierras]. The bear appeared to have been shot thru the neck into the lungs. 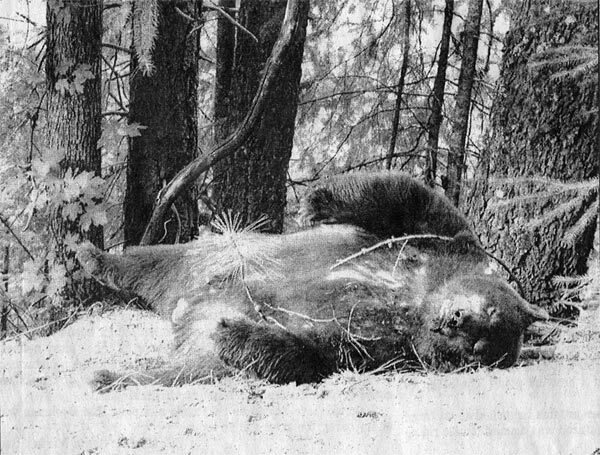 It is not known who shot the bear, nor why, but speculation has it the now deceased beast is the "garbage-bear" that had been all-to-comfortably been roaming Downieville for the past couple of weeks. Dr. Karr wishes to express appreciation to Don Russell, editor of the The Mountain Messenger, for his front-page coverage of the murder of the Downieville bear, upon June 24, 2004. Dr. Karr wants to honor and express his deep sadness at the death of the Downieville bear. The Downieville bear was a guest at Dr. Karr's Downieville grove, and had two weeks earlier, helped himself to six soda-pops. This horrible death demonstrates the current crisis in California, regarding human beings living in wilderness and mountain areas, not adequately protecting their garbage, and then killing bears and mountain lions if they become an inconvenience concerning garbage, etc. We would hope that somehow we humans could learn better to co-exist and share the beautiful world we live in with our fellow creatures. If you have feelings or thoughts regarding this horrible murder, you might write to the editor of the Mountain Messenger, Don Russell at mtnmess@cwo.com. You might also light a candle for the bear's spirit. In earth based traditions, bears are honored as brothers, sisters, and sacred animals. They are occasionally killed, but when this occurrs, they are killed in an honorable way, and their spirit is honored. We wish to continue this tradition with the spirit of the Downvieville bear. A letter was written to the editor of the Mountain Messenger in response to this event.